Let the great 2014 melting of the Arctic Begin! About one month ago, the Polar bears knocked over that north pole web cam like they did last year. Web cam has been melting further and further into the ice from the sun heating up the camera case and stand. Data is still working and being received by the buoy and web cam. We all make mistakes when posting info some times. 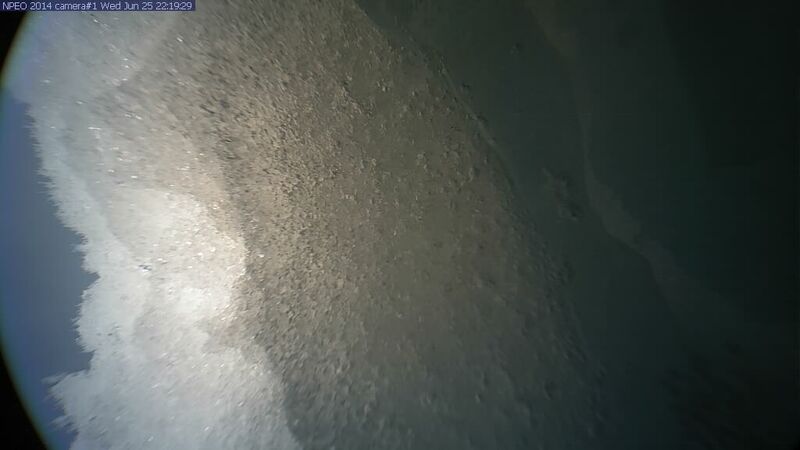 Here is the time line photos from that North pole web cam. Go to May 23, was knocked over that day. Keep up the great stuff you post, I would revise your post though. I wonder if it will all “just melt away quite suddenly”, to quote Professor Peter Wadhams 2013 prediction. The northern Norwegian city of Tromso experienced a freak summer snowfall on Monday after freezing wind from the North Pole saw temperatures plummet. It was the first time since records began that the city had seen snowfall in June. Local meteorologist Trond Lien said that sleet and snow showers hit the city on Monday night, and there has even been some snow lying on the ground. He said that the situation was “very rare”, noting that it must have been a long time since it snowed on 16 June. He added that he had found records showing that Tromso had experienced snowfall in July, but he could find nothing to indicate snow in June. I have seen this link to your valuable work a couple of places. Accolades richly deserved. You may have missed it because of the Soccer matches. It’s debauched and degrded ice.